HISD and the University of Texas MD Anderson Cancer Center have reached a first-of-its-kind agreement to provide access to an evidence-based, youth-oriented tobacco prevention and cessation program for all 110,000 HISD middle and high school students. A Smoking Prevention Interactive Experience (ASPIRE) will be made available in English and Spanish through HISD’s online learning and teaching platform, known as the HUB, and the curriculum will be used in required health and physical education classes across 46 high schools. 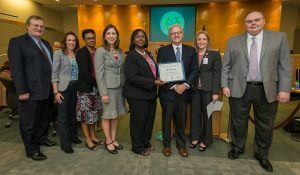 Dmitrovsky and several other representatives from MD Anderson were recognized at the Oct. 13 Board of Education meeting for their efforts at facilitating the partnership at zero cost to the district. HISD served as a source for the early testing of the original ASPIRE research study, which included 16 Houston schools in the early 2000s. Thus far, more than 14,000 HISD students have used ASPIRE, primarily through health and physical education programs. This entry was posted in Health/Wellness, High Schools, News and tagged MD Anderson on October 14, 2016 by HISD Communications.